I was in a show! I was so pleased that one of my paintings was accepted into the Sooke Fine Arts show this summer! It was amazing to have my work juried by gallery owners, artists and art teachers and to be included in this wonderful show that celebrates art and artists from Vancouver Island. 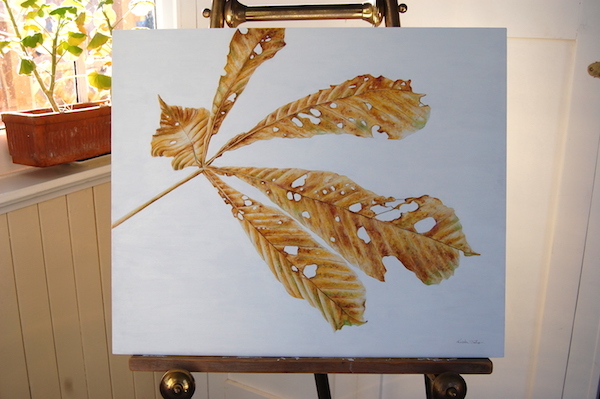 The painting that was accepted was my large chestnut tree leaf entitled "It was time to let go". Here it is hanging at the show, all lit up and labeled. It doesn't seem that long ago that I picked up that leaf off my front yard lawn thinking it looked interesting and brought it into the house. The post I wrote about it last fall is here. It's so encouraging (and fun!) to have my painting in a show and to share my art with more people. I hope some of you had a chance to visit the show and take in all the great art from our Island.